Image Size: 32"w x 22"h.
This is one of Z.S. 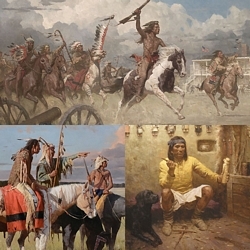 Liang’s most dynamic visions of Native American life. The passion and might of these warriors is palatable as they twist and whirl around the yellow bonfire flames during this pre-raid ritual. "War Dance" is one of the most impressive paintings Z.S. Liang has created. The energy and power of this fine work of art will transform any room in which it hangs.